The Office of Transfer Credit and Articulation will provide transfer students with the information and resources they need to transfer to the UA. Services for current and prospective transfer students have been centralized with the creation of the Office of Transfer Credit and Articulation. Spearheaded by the Office of the Provost and Student Affairs Enrollment Management/Academic Initiative Student Success, the office will provide transfer students with the information and resources they need to transfer to the UA and get help determining how the credits they already earned can be applied to a UA degree. The unit is expected to open in about two weeks. Having a central office to guide prospective students through the transfer process – instead of providing those services through departments and colleges – is expected to make it dramatically easier for those who are considering a transfer. "As a former transfer student myself, I know how hard it is for students to determine which credits are transferrable, the time to complete a degree, and the cost of degree options," said the office's senior director, Nicole Kontak. "With the creation of this office, we're empowering students because they'll have answers to these questions before they even apply." The announcement comes at a critical time for higher education institutions and transfer students alike as enrollment in community colleges is projected to grow from 6.5 million to 8.2 million students by 2025. According to information provided by the office, about 46 percent of students who complete degrees at four-year institutions were previously enrolled in two-year institutions. "Transfer students are an important part of our enrollment management plan," said Gail Burd, senior vice provost for academic affairs. "The Office of Transfer Credit and Articulation will facilitate the transfer process by providing students more information about which of their courses transfer and articulate with academic programs at the UA. We are easing the transfer process and providing students with all the tools and resources that they need to succeed." Students who are considering the UA as their academic home have options to choose from. They can matriculate on the UA's main campus, attend classes at one of the UA's distance campuses or enroll in an online UA degree program. "Each transfer student is very unique," said Kasey Urquidez, vice president for enrollment management and student affairs advancement and dean of undergraduate admissions. "They come from all over the world and from many different educational backgrounds, so each student will need a specific understanding how their situation will apply to their career at the UA, and we will make that process easier for them." Once fully up and running, the Office of Transfer Credit and Articulation will employ 15 full-time employees. In a crucial next step, Urquidez explained, the UA will implement "Transfer Map," a tool the UA is co-developing with Civitas Learning Inc.
"Once launched, a student will be able to log into Transfer Map, create a profile, and upload the courses they have taken to see the UA course equivalents," Urquidez said. "They will also be able to see how their coursework will fit into a degree program and how much it would cost them." To ensure the effectiveness of Transfer Map, the Office of Transfer Credit and Articulation will develop a comprehensive catalog of articulation rules, an endeavor expected to take two to three years. These rules will be built into UAccess to provide students with detailed information about course equivalencies necessary to fulfill degree requirements. Articulation is the first step in preparing a transfer, Urquidez explained. "This is where we take a course offered at another institution and take a look at how the various components of that course compare with what is being taught here at the UA," Urquidez said. "As students are determining where to go to school, they look into course offerings at the UA suited to their goals, but they also want to know how they can use their previous academic accomplishments. "We see this as an amazing opportunity to continue our ongoing commitment to the provision of resources and information to current and prospective transfer students," she said. Urquidez pointed out that the Office of Transfer Credit and Articulation will partner with UA faculty and departments, other universities, community colleges and other organizations to create, clarify and communicate articulation policies. "No decisions will be made without the proper input from our partners," she said. Many UA leaders, such as Andrew Comrie, senior vice president for academic affairs and provost, also see the initiative as a key driver of sustainability in the UA’s model of student success. "To date, important University investments have been made to plan and support all students, including active learning environments and best practices in pedagogy," Comrie said. "We are leveraging these investments forward with the creation of this office and, best of all, making it easier for transfer students to receive a meaningful and fulfilling educational experience at the UA." 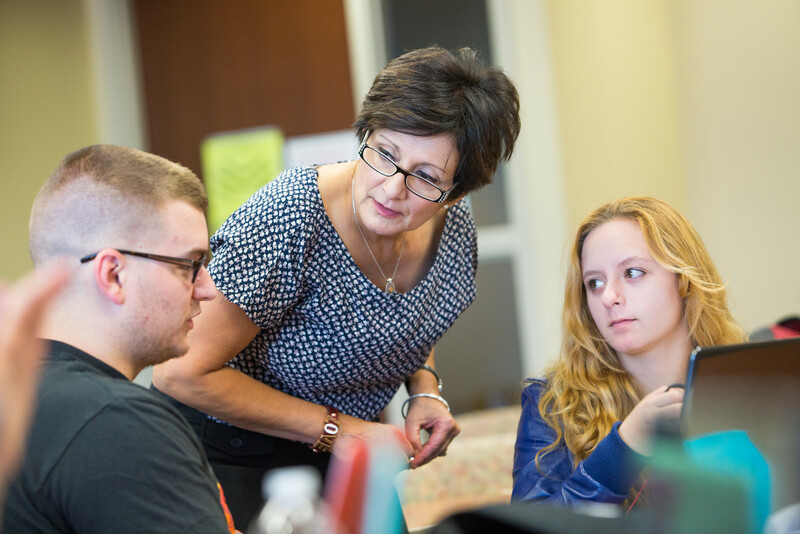 "The Office of Transfer Credit and Articulation is a critical investment in our students and their future," said Melissa Vito, senior vice president for student affairs and enrollment management and senior vice provost for academic initiatives and student success. "Not only will it enrich the lives of our current students, it also ensures that future students will have access to a world-class education and find success at the UA for years to come." Employee with questions can contact Kontak at nicoler@email.arizona.edu. Students can visit the Office of Credit Transfer and Articulation, on the fourth floor of the Student Union Memorial Center, or send email to articulation@email.arizona.edu.